Big Boss, for making the editor that made this mod possible. In this mod, I have made a number of small changes designed to mitigate some of the more annoying aspects of the game without changing too much fundamentally, as well as some changes designed to make a bit more sense (e.g. Only allowing a single copy of the 12 Zodiac-exclusive upgrade weapons). In general this mod will make the game easier but only minorly so. 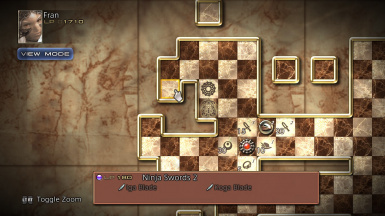 It's especially good for completionists -- a few of the rarest items are much easier to get without being blessed by the RNG, as well as being able to get all abilities on whatever licence boards you choose (with the option Esper lock change). A number of treasure chests have been changed as well, including a 100% spawn rate for all non-repeatable chests. -Mina and Vrsabha can now be gotten from the Bazaar. 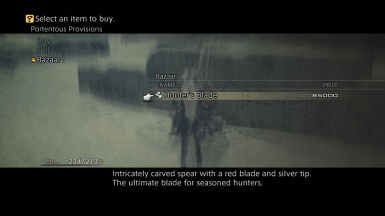 -Zodiac Spear is now a 100% non-respawning chest in Henne. -Mirage Vest doesn't require Cerobi farming if you miss one-time steals. I would love more ideas! I will behappy to impliment anything else that's doable. Of course anything I missed or isn't working I want to know about too. Feel free to contact me on Discord (Melodia#7419), Twitch (Melodia42) or PM me here on the Nexus (TerraEpon).